© Keglowich and Borger; Licensee Bentham Open. Asthma affects more than 300 million people worldwide and its prevalence is still rising. Acute asthma attacks are characterized by severe symptoms such as breathlessness, wheezing, tightness of the chest, and coughing, which may lead to hospitalization or death. Besides the acute symptoms, asthma is characterized by persistent airway inflammation and airway wall remodeling. The term airway wall remodeling summarizes the structural changes in the airway wall: epithelial cell shedding, goblet cell hyperplasia, hyperplasia and hypertrophy of the airway smooth muscle (ASM) bundles, basement membrane thickening and increased vascular density. 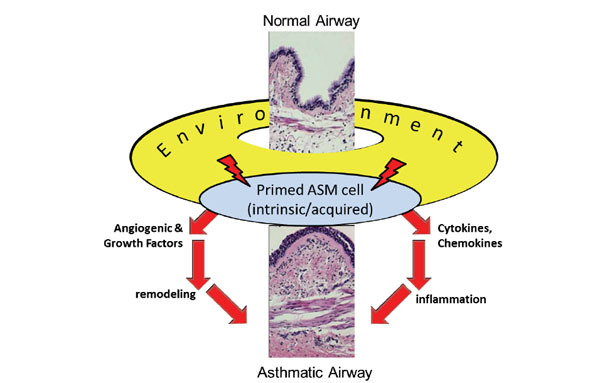 Airway wall remodeling starts early in the pathogenesis of asthma and today it is suggested that remodeling is a prerequisite for other asthma pathologies. The beneficial effect of bronchial thermoplasty in reducing asthma symptoms, together with the increased potential of ASM cells of asthmatics to produce inflammatory and angiogenic factors, indicate that the ASM cell is a major effector cell in the pathology of asthma. In the present review we discuss the ASM cell and its role in airway wall remodeling and angiogenesis. Keywords: Asthma, airway smooth muscle, airway remodelling, angiogenesis. One of the distinct features of the asthmatic lung is airway wall remodeling, which refers to persistent cellular and structural changes in the airway wall. In progressive disease, airway remodeling includes epithelial goblet cell hypertrophy, enhanced collagen deposition and airway wall hyperplasia. As early as 1922, it was recognized that the lungs of asthmatic patients are characterized by an increased thickness of the airway wall, in particular by an enlarged bulk of smooth muscle mass . We now know that this increase is predominantly caused by mesenchymal (or: airway tissue forming) cells and a correlation between airway wall thickness and disease severity has been established [2-4]. In the asthmatic airway wall, we usually observe basement membrane thickening, hyperplasia and hypertrophy of ASM cells, and increased vascularity. In addition, we often observe epithelial cell shedding and thickening, goblet cell hyperplasia, and mucus gland hypertrophy [5-8]. It remains a matter of debate whether the immune system is the key player in asthma pathogenesis or whether tissue-forming lung cells are sufficient to explain the development of asthma . The latter view is supported, however, by the observation that airway wall remodeling is observed in preschool children without clinical signs of inflammation [10-17]. Thickening of the airway wall sub-epithelial cell layers, together with the edematous effects of increased numbers of blood vessels results is airway narrowing, the major long term complication of asthma . Fig. (1A-D) illustrates several of the pathologies of the remodeled airway wall as it can be observed in asthma patients. 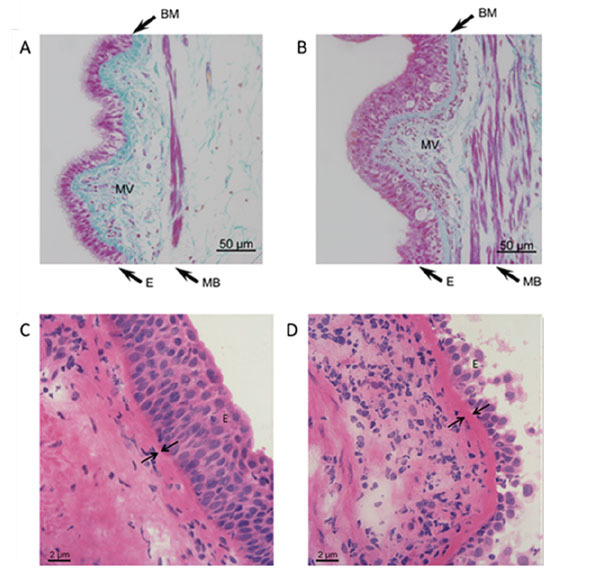 Top: Milligan’s trichrome stained sections of airway tissue from non-asthma (A) and asthma (B) patients. Images are representative of tissues obtained from 3 non-asthmatic and 3 asthmatic patients. Nuclei and muscle: magenta, collagen: green, RBC: orange. Note epithelial hyperplasia, thickening of muscle bundles and basement membrane, and increased microvessel density in asthmatic airways. E = epithelium, MB = muscle bundles, BM = basement membrane, MV = microvessels. Bottom: Light microscopic images of Haematoxylin- Eosin-stained airway tissue sections obtained from a non-asthma (C) and an asthma (D) patient. Note the increased thickening of the basement membrane in the asthmatic airways. E = epithelium, arrows are indicating the basement membrane. (Figure adapted from references 89 and 106). From the airway lumen down towards the connective tissue (CT) in the deeper regions of the airway wall we successively encounter the epithelium, the basement membrane, the submucosa (SM) containing mesenchymal cells (predominantly fibroblasts) and microvessels, and finally smooth muscle cells. 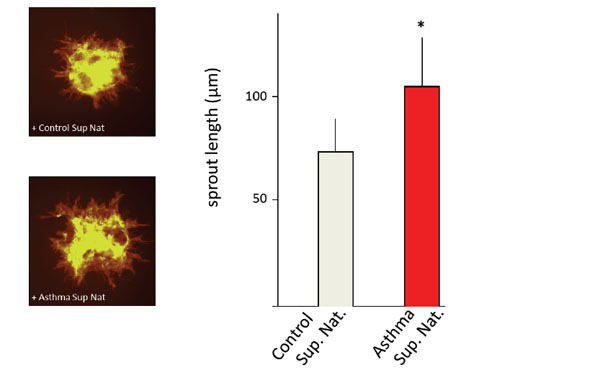 Neovascularization (spout-outgrowth from human vascular endothelial cells (EC)-spheroids is increased in the presence of super natant (Sup Nat) obtained from asthmatic ASM cells (left panel). Images are representative for illustrating sprout outgrowth from ECspheroids incubated with supernatants of non-asthmatic and asthmatic ASM cells (as indicated). Lengths of sprouts are indicated as the calculated mean (±SD) of the longest 10 sprouts. * p < 0.05. Further details about sprouting and angiogenesis assays can be found in references 89 and 106. Schematic illustration of the HIF oxygen-sensing pathway. Under normal oxygenation HIF1α is ubiqitinated and degraded in the proteasome. Low oxygen concentrations (hypoxia) induce HIF1β, followed by formation of the hetero-dimeric HIF transcription factor, which is required for the transcription of angiogenic factors (for details see text). Schematic presentation of the proposed central role of the airway smooth muscle (ASM) cell in airway wall remodeling. Due to predisposition (intrinsic) and/or environmental (acquired) cues (allergens, hypoxia), ASM cells of patients with asthma are “primed” to release abnormal levels of remodeling factors (angiogenic and growthfactors, as well as cytokines and chemokines). Traveling from the airway lumen down towards the connective tissue in the deeper regions of the airway wall, we first encounter the epithelium (Fig. 2). Epithelial cells have long been considered merely a mechanical barrier protecting the body from the environment. It is the first barrier against all influences from outside (allergens, pollutants, temperature, etc.) and has been reported to be damaged and metaplastic (pseudostratisfied) in asthma. Epithelial cells produce a vast spectrum of cytokines and chemokines [19, 20]. It has been shown that epithelial cell proliferation in asthmatics is impaired, which was attributed to altered level of several markers of proliferation such as proliferating cell nuclear antigen (PCNA), Ki67, and p21 [21-23]. Furthermore, in asthmatics the composition of the extracellular matrix, which forms hemi-desmosomes with the epithelial cells, is altered and the expression of tight-junction proteins is reduced [24-26]. These findings suggest a chronic injury of the airway epithelium with reduced ability to repair and may underlay the increased sensitivity to aspecific (e.g. cold air) and specific stimuli (e.g. smoke, ozone), as well as the increased release of pro-inflammatory factors [23, 27, 28]. Directly beneath the epithelium we encounter the basement membrane (BM), a thin but robust sheet of fiber-structured proteins (e.g. collagens, fibronectins). In healthy lungs, the thickness of the BM measures 5–7 µm, while in asthmatics the size can be found increased up to 5 times [29, ; compare Fig. 1C, 1D]. A multitude of cell types present in the lung can potentially contribute to BM thickening through a distorted deposition of extracellular matrix (ECM) components. Thickening of the asthmatic BM is due to increased deposition of collagen I and III, tenascin, and fibronectin, likely produced by activated myofibroblasts [30, 31]. Several studies demonstrated that the BM is thickened, even in young asthmatic children and this thickening is comparable to that observed in adults [15, 24, 32, 33]. The increased BM thickening has been shown to be correlated with ASM cell mass, indicating that alterations in ECM composition and subsequent BM thickening may be dependent depend on the activity of ASM cells . Furthermore, the ECM is a reservoir for secreted factors, which can be released upon degradation/reconstruction of the ECM within the tissue. VEGF for instance binds to the ECM through heparan sulphate proteoglycans and is released upon matrix degradation processes [35, 36]. When airway remodeling was reported for the first time it was described as a thickening of the BM . Decades after this first description of BM thickening electron-microscopy revealed that the thickened layer is not the BM itself but a zone adjacent to it – the lamina reticularis . Among chronic inflammatory lung diseases, which are also accompanied by ECM alterations (e. g. cystic fibrosis or chronic obstructive pulmonary disease (COPD)) BM thickening – including alterations in dimension and composition – is a unique pathology of asthma . The thickening of the BM has also impact on the efficacy of treatment, as it was correlated with a limited short-term responsiveness to GC treatment . Traveling further down the airway wall, we now enter the submucosa. This layer predominatly exists of connective tissue (CT) and mesenchymal cells, in particular fibroblasts (Fig. 2). Normally, the submucosa is scarsely vascularized and only few micro vessels are observed. In contrast, the submucosa of asthmatic patients is characterized by a marked intensification of vascularity, as well as an increased presence of eosinophils and mast cells (compare Fig. 1A, B). In the asthmatic lung, eosinophils have long been recognized as important immunomodulatory cells involved in airway wall remodeling. Indeed, depletion of eosinophil-derived cytokines reduced deposition of ECM proteins in the subepithelial BM of mild atopic asthmatics [40, 41]. Furthermore, eosinophils produce TGF-β1 which promotes proliferation of fibroblasts, as well as myo-fibroblast maturation and collagen synthesis . Eosinophils and mast cells produce several angiogenic factors, including VEGF, and may thus help to direct angiogenesis in the asthmatic submucosa [43-46]. Travelling still further down the airway wall, we finally touch the most striking feature of the asthmatic airway wall: the distinctive increase of the bulk of ASM cells [47, 48; compare Fig. 1A, B]. Smooth muscle cells, which surround the airways from the trachea down to the alveolar ducts, are the effector cells that determine the diameter of the airways. These are the cells that make the airways to relax or to constrict. Bronchoconstriction is the most severe symptom of an asthma attack and ASM cells are the major effector cells and the proximal cause of the excessive airway narrowing . The constriction is completely or partially reversible, but sometimes only with the help of bronchodilating drugs. Two features of ASM cells are characteristic for asthma patients. First, we observe airway hypersensitivity, which refers to the increased response of ASM cells to low doses of stimuli. Second, the ASM cell of asthmatics demonstrates hyperreactivity, which describes an abnormal strong bronchoconstrictive response. Together, hypersensitivity and hyperreactivity of the ASM cell add up to the well-known asthma-characteristic airway hyperresponsiveness (AHR) , AHR can be induced by a plethora of environmental and/or systemic alterations, including allergen-challenge, sudden temperature changes, reduced humidity, exercise, increased inflammatory mediators, viral infections, etc. The bio-molecular cause for AHR remains unclear, however, although it may be due to fundamental changes within the ASM cell [51-53]. It should be noted, however, that the asthmatic ASM cell itself is not contracting stronger. Rather, the increased number of ASM cells (hyperplastia) causes a faster contraction relative to healthy individuals, in addition to an impaired relaxation [54, 55]. The increased ASM mass is already present in young adults (17-23y)  and in children without any signs of eosinophilic inflammation [12, 57]. This suggests that the increased number of ASM cells may be the cause rather then the consequence of progressing disease. In addition, ASM cells are highly productive cells, in the sense that they produce a variety of inflammatory and angiogenic mediators, including GM-CSF, IL-1β, IL-2, IL-5, IL-6, IL-8, IL-11, IL10, Eotaxin, bFGF, PDGF-BB and VEGF . In addition, ASM cells of asthmatic patients have a distinct hyper-reactive (“primed”) phenotype, which is characterized by an increased release of pro-inflammatory factors and mediators. For instance, ASM cells of asthmatics release more IL-6 and IL-8 after stimulation with house dust mite (HDM) extracts or after rhinovirus infection [51, 52]. The release of many of the aforementioned cytokines can be induced by several stimuli or in paracrine and autocrine regulated mechanisms. This shows that ASM cells of the airways provide a mechanism how inflammation may be amplified and/or perpetuated without the involvement of immune cells. Furthermore, ASM cells are an important source of ECM components. ASM cells incubated with serum obtained from asthma patients demonstrated an increased production of fibronectin, lamin-γ, and proteoglycans [53, 59, 60]. In addition, ASM cells from asthmatics produce more connective tissue growth factor (CTGF), which may further contribute to BM thickening (as described above) [61, 62]. It is also of note that the number of mast cells in deeper regions of the airway wall is markedly increased and it has been suggested that mast cells are involved in “programming” (or “priming”) the adjacent ASM cells of asthmatics [63-67]. In contrast to the mast cells present in the submucosa, the mast cells located in the ASM bundles are always tryptase and chymase positive (MCTC) and their number has been linked to the severity of asthma  and airway hyperresponsiveness . Mast cells are thought to be a major source of angiogenic factors in the lung and the number of tryptase-positive mast cells has been correlated with angiogenesis in human endometrial cancer . Angiogenesis refers to the formation of new blood vessels from endothelial cells, a complex process involving multiple factors with either promoting (angiogenic) or counteracting (angiostatic) actions. In diseases associated with a pathological increase in vasculature, such as the submucosa of asthma patients, the net balance must be shifted towards pro-angiogenic factors. This can be accomplished through a reduction of angiostatic factors, the increase of angiogenic factors or a combination of both. The first report that vascular abnormalities occur in the airways of asthma patients was published in 1960, when Dunhill and coworkers reported the dilatation of blood vessels in lung tissue from asthma patients . Currently, it is well-documented that the sub-epithelial submucosa of the lungs of asthmatic patients displays an increased vascular density – both ex vivo and in vivo [24, 71-73]. In addition, several abnormal modifications of the bronchial vasculature have been described in the asthmatic airways. In asthmatic humans, as well as in animal models of asthma, the blood flow in the lung is increased [74-77]. Morover, the vessels present in the submucosa of asthmatics are more permeable . This not only leads to edema, it is also a prerequisite for tissue inflammation, as the extravasation of inflammatory cells to the tissue requires transmigration through the endothelium. Increased vascularization has been shown to correlate to airflow limitation [71, 79, 80] and bronchial hyperresponsiveness [80-82], hence contributing significantly to the pathology of asthma. Additional studies provided further evidence that vascular density and asthma severity are linked [46, 83-85]. Furthermore, in the submucosa of asthma patients increased levels of VEGF, bFGF and angiogenin have been observed [86-88]. Simcock and coworkers demonstrated that human ASM cells of asthmatic patients produced higher levels of angiogenin, angiopoietin, VEGF, EGF, IGF-1, IFNγ, TIMP-1 and TIMP-2 in response to stimulation with either IL-13 or TGF-β [86, 87]. Recent studies in our laboratory demonstrated that human ASM cells of asthma patients also released significanly more VEGF, angiogenin, IL-6, MCP-1 and importantly three CXCR2 ligands, namely ENA-78, GRO-α and IL-8 . CXC-chemokines and their receptors are responsible for the progression of many solid tumors, including breast cancer, bronchogenic carcinomas, and malignancies of the gastrointestinal tract, prostate cancer, ovarian cancer, glioblastoma, as well as head and neck cancer [90-95]. CXC-chemokines are also involved in several lung diseases, which involve altered angiogenesis such as idiopathic pulmonary fibrosis, obliterative bronchiolitis, or acute respiratory distress syndrome [96-98]. Comparing the angiogenic potential of ASM cells of asthmatic patients to those of non-asthmatics, we demonstrated that ASM cells of asthmatic patients promote angiogenesis through elevated secretion of the CXC-chemokines ENA-78, GRO-α and IL-8 . Endothelial cell sprouting was significantly increased upon incubation with culture supernatants of ASM cells of asthma patients relative to those of non-asthmatic control subjects and that these effects were solely mediated via the CXCR2 receptor [99; Fig. 3]. Apparently, asthmatic ASM cells exhibit an increased potential to synthesize CXCR2 ligands and may hence help directing the neovascularization in the submucosa of the lungs of asthma patients. Elevated levels of ENA-78, GRO-α and IL-8 have indeed been reported to be present in the BALF/sputum of asthmatic subjects [99, 100]. The increased angiogenic potential of ASM cells of asthma patients may thus explain the increased vascular density in the submucosa observed in the airways of asthma patients. These findings supplemented previous studies showing that ASM cells are a major source of angiogenic factors and that CXCR2 ligands are elevated in the airway lining fluids of asthma patients [86, 87]. Studies in several model organisms (mice, sheep, and primates) showed that HDM allergens increased vascularity of the lungs [101-104]. HDM allergens therefore directly contribute to airway wall remodeling via a non-immune cell mediated mechanism. These data support earlier findings that HDM exerted its effect independently of the immune system via resident tissue-forming cells . Interestingly, the CXC-chemokine ENA-78 is selectively degraded by the proteolytic activity present in HDM extract . Since HDM extract did not have a direct effect on the angiogenic potential of ASM cells, the angiogenic effects might be mediated by immune or endothelial cells, which may release angiogenic mediators upon stimulation with proteases present in HDM excrements . Because ENA-78 acts primarily on neutrophils, altered ENA-78 levels in the lungs may not only affect angiogenic, but also inflammatory responses in the airways of asthma patients. Data on neutrophil transmigration indeed suggested a diminished migration of neutrophils when ENA-78 was incubated with HDM extract . Therefore, the presence of proteases and/or HDM allergens in the airways may alter the bio-availability of ENA-78 and modulate both angiogenic and immune responses. Similarly, a disturbed release off endogenously produced metalloproteinases from activated endothelial cells may affect the turnover of vessel-forming proteins , and influence the angiogenic process. Specifically, ADAM33 is thought to play a role in airway remodeling because of its high expression in epithelium, myo/fibroblasts, and airway smooth muscle cells and its role in promoting angiogenesis and stimulating cell proliferation and differentiation . In vivo, the key trigger to induce angiogenesis is hypoxia, i.e. the diminished availability of oxygen in organs and tissues. Hypoxia is observed in many physiological conditions, including embryonic development and differentiation or wound healing. In addition, hypoxia occurs as the consequences of several pathologies including tumor progression, interstitial lung diseases, arteriosclerosis, COPD and asthma [109-111]. Hypoxia of the airways can be caused by a range of mechanisms, including diminished ventilation drive, airway obstruction, intra-alveolar exudates, airway wall inflammation, in addition to fibrosis and basement membrane thickening . That the ASM cells of asthma patients is consuming more oxygen is reflected in the increase of mitochondria , a phenomenon that may further add to locally restricted hypoxia. Moreover, an increased ASM mass needs more nutrients and oxygen, hence more vessels. The increased vascularization in the submucosa may contribute to asthma pathology in several ways. First, increased vessel leakage may cause tissue edema and thereby narrowing of the airways. Second, plasma exudation may create and/or aggravate local inflammation and remodeling. Third, an increased blood supply provides the hyperplastic and hypertrophic ASM cells with the required nutritions and oxygen. Reducing the vascularization may therefore counteract both airway wall remodeling and inflammation. Hypoxia is always associated with the activation of proteins of the hypoxia inducible factor (HIF)-family. The activation of the HIF-pathway allows the cells to adapt to external factors (in this case the low oxygen concentration). The major component of hypoxia signaling is the transcription factor HIF, which is comprised of two subunits (HIF-α and HIF-β). The HIF-1β subunit is constitutively expressed and dimerizes with one out of its three potential binding partners HIF-1α, HIF-2α or HIF-3α. Under normal oxygen conditions (normoxia), the HIF-α proteins have a very short half-life and are, by hydroxylation of two proline-residues in the oxygen-dependent degradation domain, constantly targeted for proteasomal degradation . Ubiquitinylation of hydroxylated HIFα is mediated by the Von Hippel-Lindau protein (VHL) . Under low oxygen concentrations hydroxylation is impaired and results in increased levels of HIF-α. HIF-α is then translocated to the nucleus, dimerizes with the HIF-β subunit and the active transcription factor binds to hypoxia response elements in the promotor regions of downstream target genes . Currently, approximately 100 targets genes of the oxygen-sensing pathway are known and their corresponding proteins are implicated in tissue angiogenesis, erythropoiesis ventilation, glycolysis, and autophagy . A simplified scheme of the HIF-dependent pathway is presented in Fig. (4). Only recently, a role for hypoxia in the pathogenesis of asthma has been appreciated. For oxygen supply, ASM cells depend on either diffusion though the basement membrane or oxygen delivered by microvessels present in the airway wall. The airway wall of asthmatics is characterized by inflammation and an increased bulk of ASM cells: highly active, oxygen consuming tissue. Furthermore, local hypoxic conditions may occur due to increased thickness and altered composition of the basement membrane, as well as of edema, which may affect the rate of oxygen diffusion [117-119]. The observed increased thickness of the basement membrane of asthma patients may induce a locally restricted hypoxic environment. In addition, increased oxygen consumption, for instance by inflammatory cells and growing BSMC may further add to hypoxic conditions in the asthmatic lung . Together, these conditions may affect the properties and behavior of BSMC, for instance through the induction of HIF. In a rat model of asthma, expression of the transcription factor HIF was indeed associated with airway inflammation, whereas elevated levels of HIF have been detected in endobronchial biopsies and in the bronchial alveolar lavage fluid of asthmatics [110, 120]. Furthermore, increased levels of HIF subunits (HIF-1α and HIF-1β) were found in lung tissues and epithelial cells of asthmatic patients and correlated with VEGF . Recently, we showed that hypoxia significantly reduced the proliferation of BSMC of both asthmatic and non-asthmatic subjects, but with differential responses . Under moderate hypoxic conditions (5% O2), only asthmatic ASM cells significantly reduced proliferation, leaving that of non-asthmatic control cells unaffected. Stringent hypoxic conditions (1% O2) significantly reduced the proliferation of ASM cells from both asthmatics and non-asthmatics. The reduced proliferation under stringent hypoxic conditions (1% O2) was confirmed by lower levels of PCNA- and cyclin E proteins in BSMC of asthmatic and non-asthmatic subjects . This shows that ASM cells of asthmatics are more prone to hypoxic conditions than their non-asthmatic counterparts. The reason for this difference is unclear, but it might reflect diminished proliferation control responses as observed in cultured asthmatic BSMC [51, 53]. In addition, we showed that hypoxia enhanced the release of VEGF, and the angiogenic cytokines IL-6 and IL-8 in ASM cells, with no significant differences between asthmatics and non-asthmatics . It is unlikely, therefore, that the increased vascularization of the submucosa, as it is observed in the airway wall of asthma patients, can be ascribed to the release of these factors under hypoxic conditions. The finding that CXCR2 are important mediators of angiogenesis may provide an additional mechanism how angiogenesis in the asthmatic airway wall can be induced independently of VEGF. Once thought to be merely an immunological disorder, asthma is increasingly recognized as a disease of the airway wall with the ASM cells as a major player in inflammatory and remodeling responses. Persistent airway wall remodeling is now a well-established pathology of the asthmatic lung and the major player may well be the ASM cell. Relative to their healthy counterparts, ASM cells of asthma patients release more cytokines and chemokines, as well as increased levels growth and angiogeneic factors (Fig. 5). This suggests that the ASM cells of asthma patients are hyper-active (or: “primed”) and may thus induce or aggrevate airway wall remodeling. This “priming” may also be reflected in the lack of efficacy of standard asthma medication in counteracting the airway wall remodeling. Usually, asthma is treated with beta-mimetics, with glucocorticosteroids (GC), or with a combination of these drugs. Beta-mimetics induce the relaxation of ASM cells, hence reducing bronchoconstriction, whereas GC are very effective at reducing airway inflammation. Despite the benificial anti-inflammatory actions of GC, it remains controversial whether GC are also able to reduce or reverse airway wall remodeling. Recent studies indicate that only high doses of inhaled GC can reduce some components of airway remodelling, such as the increased airway wall vascularity and the basement membrane thickness [122-124]. In contrast, GC do not affect ASM cells proliferation and associated remodeling . Due to lack of specific targets, we currently lack an adequate, non-invasive treatment of the “primed” ASM cell. But this may change soon. Recently, we performed large-scale profiling analyses of signalling pathway activation signatures in ASM cells of asthmatic and non-asthmatic subjects . Of the 270 studied signaling pathways, we observed that a substantial fraction of them was significantly more active in asthmatic ASM cells, so that ASM cells of asthmatic patients can be clearly distinguished from those of non-asthmatics. Importantly, the identified pathways predominantly represented pathways linked to cell proliferation and growth, vascularization, inflammatory response and muscle-tissue specific responses, such as contractility. This study was the first to provide clear-cut evidence for an overall, intrinsic “primed” status of asthmatic ASM cells and may reflect the genetically predisposition of the disease . The realization that the “primed” ASM cells may be pivotal to regulating and controling both inflammation and remodeling of the airways may provide an entry to completely unexplored fields of asthma treatment. Notably, if the airway remodeling – not the inflammation – is the primary etiological event leading to asthma as suggested by studies in asthmatic children [10-17], then asthma prevention might become possible by specifically treating the airway smooth muscle cells, averting them to become hyper-active, hypertrophic and hyperplastic. Indeed, a new, invasive therapy option that specifically addresses the ASM cells has already been used in cases of uncontrolled asthma: thermoplasty. This treatment involves locally restricted heating of the airway wall using radiofrequency energy and significantly reduces the mass of ASM . Thermoplastic reduction of ASM cells reduced the frequency of asthmatic exacerbations [128-133], and in several cases of severe asthma, thermoplastic treatment led to a marked reduction of asthma symptoms and a stable lung function over a long period of time . The efficacy of thermoplasty further emphasizes the role of ASM cells in the pathogenesis of asthma, which makes the search for non-invasive medication and therapeutic strategies that reduce – or even completely abrogate – the remodeling processes worthwhile. For instance, the increased angiogenic potential of ASM cells of asthma patients might be reduced by antagonizing or blocking the CXCR2 receptor or its ligands. Studies with CXCR2-blockers and ligand-neutralizing agents in the context of different diseases, such as rheumatoid arthritis and COPD, are ongoing [129, 134]. In vitro, we showed that this strategy abrogated the increased sprout outgrowth from EC spheroids induced by super natants of asthmatic ASM cells . CXCR2 also mediates the recruitment of endothelial progenitor cells during allergic airways remodeling . Thus, the CXCR2-mediated neovascularization may be targeted using extant pharmaceutical compounds and may represent a novel strategy to reduce airway remodeling in asthma. A more profound discussion on the outcomes of recent clinical trials with anti-angiogenic therapies and their potentially asthma-resolving properties was recently provided by Harkness and coworkers . In conclusion, a fundamental demand exists to develop new treatment strategies to tackle the airway wall remodeling observed in the lungs of asthma patients. The discussed studies demonstrate a pivotal role for a “primed” ASM cell in the airway wall remodeling process. Not only do they have an increased proliferative capacity, they also produce increased levels of growth factors, chemokines and cytokines, as wel as angiogenic factors. Targeting the “primed” ASM cell to reduce its activity may act as a double edged sword. First, reduced numbers of ASM cells will lead to diminished airway contraction, hence decreasing the bronchi to constrict. Second, reduced numbers of “primed” ASM cells will reduce the inflammatory and angiogenic mediators in the airway wall and concomitantly reduced vascularization. The latter may have profound beneficial effects. Blood vessels are the primary portal for immune cells to infiltrate tissues and the increased number of blood vessels in the airway wall of asthma patients might lead to exaggerated inflammation . There is evidence that badly controlled asthma results in an increase in inflammatory cells, which are entering the airway tissue via ancillary blood vessels . Here too, both ASM cells and the endothelium might be promising novel targets to reduce airway wall remodeling and asthma symptoms. The development of (inhaled) anti-angiogenic agents might be an interesting new strategy to reduce smooth muscle mass. In the fight against cancer, the importance of angiogenesis has been recognized and several anti-angiogenic drugs have already been positively tested in clinical trials. Developers of future asthma therapies may as well look into that direction. LFK and PB were supported by a research grant of the Swiss National Foundation (#320030_124905/1). Huber HL, Koessler KK. The pathology of bronchial asthma Arch Intern Med 1922; 30(6): 689-760. Kuwano K, Bosken CH, Paré PD, Bai TR, Wiggs BR, Hogg JC. Small airways dimensions in asthma and in chronic obstructive pulmonary disease Am Rev Respir Dis 1993; 148(5): 1220-5. Little SA, Sproule MW, Cowan MD, et al. High resolution computed tomographic assessment of airway wall thickness in chronic asthma: reproducibility and relationship with lung function and severity Thorax 2002; 57(3): 247-53. Niimi A, Matsumoto H, Amitani R, et al. Airway wall thickness in asthma assessed by computed tomography. Relation to clinical indices Am J Respir Crit Care Med 2000; 162(4 Pt 1): 1518-23. Lambrecht BN, Hammad H. The airway epithelium in asthma Nat Med 2012; 18(5): 684-92. Westergren-Thorsson G, Larsen K, Nihlberg K, et al. Pathological airway remodelling in inflammation Clin Respir J 2010; 4(Suppl. 1): 1-8. Lai HY, Rogers DF. Mucus hypersecretion in asthma: intracellular signalling pathways as targets for pharmacotherapy Curr Opin Allergy Clin Immunol 2010; 10(1): 67-76. Bai TR, Knight DA. Structural changes in the airways in asthma: observations and consequences Clin Sci 2005; 108(6): 463-77. Barrett NA, Austen KF. Innate cells and T helper 2 cell immunity in airway inflammation Immunity 2009; 31(3): 425-37. Baena-Cagnani C, Rossi GA, Canonica GW. Airway remodelling in children: when does it start? Curr Opin Allergy Clin Immunol 2007; 7(2): 196-200. Bossley CJ, Fleming L, Gupta A, et al. Pediatric severe asthma is characterized by eosinophilia and remodeling without T(H)2 cytokines J Allergy Clin Immunol 2012; 129(4): 974-82.e13. Cokuğraş H, Akçakaya N, Seçkin , Camcioğlu Y, Sarimurat N, Aksoy F. Ultrastructural examination of bronchial biopsy specimens from children with moderate asthma Thorax 2001; 56(1): 25-9. Jenkins HA, Cherniack R, Szefler SJ, Covar R, Gelfand EW, Spahn JD. A comparison of the clinical characteristics of children and adults with severe asthma Chest 2003; 124(4): 1318-24. Martinez FD, Wright AL, Taussig LM, Holberg CJ, Halonen M, Morgan WJ. Asthma and wheezing in the first six years of life N Engl J Med 1995; 332(3): 133-8. Saglani S, Malmström K, Pelkonen AS, et al. Airway remodeling and inflammation in symptomatic infants with reversible airflow obstruction Am J Respir Crit Care Med 2005; 171(7): 722-7. Saglani S, Payne DN, Zhu J, et al. Early detection of airway wall remodeling and eosinophilic inflammation in preschool wheezers Am J Respir Crit Care Med 2007; 176(9): 858-64. Tsartsali L, Hislop AA, McKay K, et al. Development of the bronchial epithelial reticular basement membrane: relationship to epithelial height and age Thorax 2011; 66(4): 280-5. Hashimoto M, Tanaka H, Abe S. Quantitative analysis of bronchial wall vascularity in the medium and small airways of patients with asthma and COPD Chest 2005; 127(3): 965-72. Saenz SA, Taylor BC, Artis D. Welcome to the neighborhood: epithelial cell-derived cytokines license innate and adaptive immune responses at mucosal sites Immunol Rev 2008; 226: 172-90. Newcomb DC, Sajjan US, Nagarkar DR, Goldsmith AM, Bentley JK, Hershenson MB. Cooperative effects of rhinovirus and TNF-alpha on airway epithelial cell chemokine expression Am J Physiol Lung Cell Mol Physiol 2007; 293(4): L1021-8. Puddicombe SM, Torres-Lozano C, Richter A, et al. Increased expression of p21(waf) cyclin-dependent kinase inhibitor in asthmatic bronchial epithelium Am J Respir Cell Mol Biol 2003; 28(1): 61-8. Bucchieri F, Puddicombe SM, Lordan JL, et al. Asthmatic bronchial epithelium is more susceptible to oxidant-induced apoptosis Am J Respir Cell Mol Biol 2002; 27(2): 179-85. Kicic A, Sutanto EN, Stevens PT, Knight DA, Stick SM. Intrinsic biochemical and functional differences in bronchial epithelial cells of children with asthma Am J Respir Crit Care Med 2006; 174(10): 1110-8. Barbato A, Turato G, Baraldo S, et al. Epithelial damage and angiogenesis in the airways of children with asthma Am J Respir Crit Care Med 2006; 174(9): 975-81. Montefort S, Roberts JA, Beasley R, Holgate ST, Roche WR. The site of disruption of the bronchial epithelium in asthmatic and non-asthmatic subjects Thorax 1992; 47(7): 499-503. Shahana S, Jaunmuktane Z, Asplund MS, Roomans GM. Ultrastructural investigation of epithelial damage in asthmatic and non-asthmatic nasal polyps Respir Med 2006; 100(11): 2018-28. Truong-Tran AQ, Grosser D, Ruffin RE, Murgia C, Zalewski PD. Apoptosis in the normal and inflamed airway epithelium: role of zinc in epithelial protection and procaspase-3 regulation Biochem Pharmacol 2003; 66(8): 1459-68. Lopez-Guisa JM, Powers C, File D, Cochrane E, Jimenez N, Debley JS. 2012. Kim ES, Kim SH, Kim KW, et al. Basement membrane thickening and clinical features of children with asthma Allergy 2007; 62(6): 635-40. Roche WR, Beasley R, Williams JH, Holgate ST. Subepithelial fibrosis in the bronchi of asthmatics Lancet 1989; 1(8637): 520-4. Brewster CE, Howarth PH, Djukanovic R, Wilson J, Holgate ST, Roche WR. Myofibroblasts and subepithelial fibrosis in bronchial asthma Am J Respir Cell Mol Biol 1990; 3(5): 507-11. Bossley CJ, Fleming L, Gupta A, et al. 2012. Fedorov IA, Wilson SJ, Davies DE, Holgate ST. Epithelial stress and structural remodelling in childhood asthma Thorax 2005; 60(5): 389-94. James AL, Maxwell PS, Pearce-Pinto G, Elliot JG, Carroll NG. The relationship of reticular basement membrane thickness to airway wall remodeling in asthma Am J Respir Crit Care Med 2002; 166(12 Pt 1): 1590-5. Bergers G, Brekken R, McMahon G, et al. Matrix metalloproteinase-9 triggers the angiogenic switch during carcinogenesis Nat Cell Biol 2000; 2(10): 737-44. Lee S, Jilani SM, Nikolova GV, Carpizo D, Iruela-Arispe ML. Processing of VEGF-A by matrix metalloproteinases regulates bioavailability and vascular patterning in tumors J Cell Biol 2005; 169(4): 681-91. Jeffery PK. Remodeling in asthma and chronic obstructive lung disease Am J Respir Crit Care Med 2001; 164(10 Pt 2): S28-38. Bourdin A, Kleis S, Chakra M, et al. Limited short-term steroid responsiveness is associated with thickening of bronchial basement membrane in severe asthma Chest 2012; 141(6): 1504-11. Flood-Page P, Menzies-Gow A, Phipps S, et al. Anti-IL-5 treatment reduces deposition of ECM proteins in the bronchial subepithelial basement membrane of mild atopic asthmatics J Clin Invest 2003; 112(7): 1029-36. Kay AB, Phipps S, Robinson DS. A role for eosinophils in airway remodelling in asthma Trends Immunol 2004; 25(9): 477-82. Halwani R, Al-Muhsen S, Al-Jahdali H, Hamid Q. Role of transforming growth factor-β in airway remodeling in asthma Am J Respir Cell Mol Biol 2011; 44(2): 127-33. Chetta A, Zanini A, Foresi A, et al. Vascular endothelial growth factor up-regulation and bronchial wall remodelling in asthma Clin Exp Allergy 2005; 35(11): 1437-42. Zanini A, Chetta A, Saetta M, et al. Chymase-positive mast cells play a role in the vascular component of airway remodeling in asthma J Allergy Clin Immunol 2007; 120(2): 329-33. Hoshino M, Nakamura Y, Hamid QA. Gene expression of vascular endothelial growth factor and its receptors and angiogenesis in bronchial asthma J Allergy Clin Immunol 2001; 107(6): 1034-8. Hoshino M, Takahashi M, Aoike N. Expression of vascular endothelial growth factor, basic fibroblast growth factor, and angiogenin immunoreactivity in asthmatic airways and its relationship to angiogenesis J Allergy Clin Immunol 2001; 107(2): 295-301. Ebina M, Takahashi T, Chiba T, Motomiya M. Cellular hypertrophy and hyperplasia of airway smooth muscles underlying bronchial asthma. A 3-D morphometric study Am Rev Respir Dis 1993; 148(3): 720-6. Woodruff PG, Dolganov GM, Ferrando RE, et al. Hyperplasia of smooth muscle in mild to moderate asthma without changes in cell size or gene expression Am J Respir Crit Care Med 2004; 169(9): 1001-6. Dulin NO, Fernandes DJ, Dowell M, et al. What evidence implicates airway smooth muscle in the cause of BHR? Clin Rev Allergy Immunol 2003; 24(1): 73-84. Cain H. Bronchoprovocation testing Clin Chest Med 2001; 22(4): 651-9. Miglino N, Roth M, Tamm M, Borger P. House dust mite extract downregulates C/EBPα in asthmatic bronchial smooth muscle cells Eur Respir J 2011; 38(1): 50-8. Oliver BG, Johnston SL, Baraket M, et al. Increased proinflammatory responses from asthmatic human airway smooth muscle cells in response to rhinovirus infection Respir Res 2006; 7: 71. Johnson PR, Roth M, Tamm M, et al. Airway smooth muscle cell proliferation is increased in asthma Am J Respir Crit Care Med 2001; 164(3): 474-7. Léguillette R, Lauzon AM. Molecular mechanics of smooth muscle contractile proteins in airway hyperresponsiveness and asthma Proc Am Thorac Soc 2008; 5(1): 40-6. Léguillette R, Laviolette M, Bergeron C, et al. Myosin, transgelin, and myosin light chain kinase: expression and function in asthma Am J Respir Crit Care Med 2009; 179(3): 194-204. Bai TR, Cooper J, Koelmeyer T, Paré PD, Weir TD. The effect of age and duration of disease on airway structure in fatal asthma Am J Respir Crit Care Med 2000; 162(2 Pt 1): 663-9. Pohunek P, Warner JO, Turzíková J, Kudrmann J, Roche WR. Markers of eosinophilic inflammation and tissue re-modelling in children before clinically diagnosed bronchial asthma Pediatr Allergy Immunol 2005; 16(1): 43-51. Hirst SJ. Regulation of airway smooth muscle cell immunomodulatory function: role in asthma Respir Physiol Neurobiol 2003; 137(2-3): 309-26. Johnson PR. Role of human airway smooth muscle in altered extracellular matrix production in asthma Clin Exp Pharmacol Physiol 2001; 28(3): 233-6. Johnson PR, Black JL, Carlin S, Ge Q, Underwood PA. The production of extracellular matrix proteins by human passively sensitized airway smooth-muscle cells in culture: the effect of beclomethasone Am J Respir Crit Care Med 2000; 162(6): 2145-51. Burgess JK, Johnson PR, Ge Q, et al. Expression of connective tissue growth factor in asthmatic airway smooth muscle cells Am J Respir Crit Care Med 2003; 167(1): 71-7. Xie S, Sukkar MB, Issa R, Oltmanns U, Nicholson AG, Chung KF. Regulation of TGF-beta 1-induced connective tissue growth factor expression in airway smooth muscle cells Am J Physiol Lung Cell Mol Physiol 2005; 288(1): L68-76. Brightling CE, Bradding P, Symon FA, Holgate ST, Wardlaw AJ, Pavord ID. Mast-cell infiltration of airway smooth muscle in asthma N Engl J Med 2002; 346(22): 1699-705. Bradding P, Walls AF, Holgate ST. The role of the mast cell in the pathophysiology of asthma J Allergy Clin Immunol 2006; 117(6): 1277-84. Kaur D, Saunders R, Berger P, et al. Airway smooth muscle and mast cell-derived CC chemokine ligand 19 mediate airway smooth muscle migration in asthma Am J Respir Crit Care Med 2006; 174(11): 1179-88. Plante S, Semlali A, Joubert P, et al. Mast cells regulate procollagen I (alpha 1) production by bronchial fibroblasts derived from subjects with asthma through IL-4/IL-4 delta 2 ratio J Allergy Clin Immunol 2006; 117(6): 1321-7. Bradding P. Human lung mast cell heterogeneity Thorax 2009; 64(4): 278-80. Balzar S, Fajt ML, Comhair SA, et al. Mast cell phenotype, location, and activation in severe asthma. Data from the Severe Asthma Research Program Am J Respir Crit Care Med 2011; 183(3): 299-309. Norrby K. Mast cells and angiogenesis 2002. Dunnill MS. The pathology of asthma, with special reference to changes in the bronchial mucosa J Clin Pathol 1960; 13: 27-33. Vrugt B, Wilson S, Bron A, Holgate ST, Djukanovic R, Aalbers R. Bronchial angiogenesis in severe glucocorticoid-dependent asthma Eur Respir J 2000; 15(6): 1014-21. Wilson JW, Robertson CF. Angiogenesis in paediatric airway disease Paediatr Respir Rev 2002; 3(3): 219-29. Tanaka H, Yamada G, Saikai T, et al. Increased airway vascularity in newly diagnosed asthma using a high-magnification bronchovideoscope Am J Respir Crit Care Med 2003; 168(12): 1495-9. Csete ME, Chediak AD, Abraham WM, Wanner A. Airway blood flow modifies allergic airway smooth muscle contraction Am Rev Respir Dis 1991; 144(1): 59-63. Kumar SD, Emery MJ, Atkins ND, Danta I, Wanner A. Airway mucosal blood flow in bronchial asthma Am J Respir Crit Care Med 1998; 158(1): 153-6. Mendes ES, Campos MA, Hurtado A, Wanner A. Effect of montelukast and fluticasone propionate on airway mucosal blood flow in asthma Am J Respir Crit Care Med 2004; 169(10): 1131-4. Wanner A, Chediak AD, Csete ME. Airway mucosal blood flow: response to autonomic and inflammatory stimuli Eur Respir J Suppl 1990; 12(Suppl. ): 618s-23s. Nagy JA, Benjamin L, Zeng H, Dvorak AM, Dvorak HF. Vascular permeability, vascular hyperpermeability and angiogenesis Angiogenesis 2008; 11(2): 109-19. Li X, Wilson JW. Increased vascularity of the bronchial mucosa in mild asthma Am J Respir Crit Care Med 1997; 156(1): 229-33. Orsida BE, Li X, Hickey B, Thien F, Wilson JW, Walters EH. Vascularity in asthmatic airways: relation to inhaled steroid dose Thorax 1999; 54(4): 289-95. Kanazawa H, Hirata K, Yoshikawa J. Involvement of vascular endothelial growth factor in exercise induced bronchoconstriction in asthmatic patients Thorax 2002; 57(10): 885-8. Kanazawa H, Asai K, Hirata K, Yoshikawa J. Vascular involvement in exercise-induced airway narrowing in patients with bronchial asthma Chest 2002; 122(1): 166-70. Chetta A, Zanini A, Torre O, Olivieri D. Vascular remodelling and angiogenesis in asthma: morphological aspects and pharmacological modulation Inflamm Allergy Drug Targets 2007; 6(1): 41-5. Grigoraş A, Căruntu ID, Grigoraş CC, Mihăescu T, Amălinei C. Relationship between immunohistochemical assessment of bronchial mucosa microvascularization and clinical stage in asthma Rom J Morphol Embryol 2012; 53(3): 485-90. Simcock DE, Kanabar V, Clarke GW, et al. Induction of angiogenesis by airway smooth muscle from patients with asthma Am J Respir Crit Care Med 2008; 178(5): 460-8. Simcock DE, Kanabar V, Clarke GW, O’Connor BJ, Lee TH, Hirst SJ. Proangiogenic activity in bronchoalveolar lavage fluid from patients with asthma Am J Respir Crit Care Med 2007; 176(2): 146-53. Tuder RM, Yun JH. Vascular endothelial growth factor of the lung: friend or foe Curr Opin Pharmacol 2008; 8(3): 255-60. Keglowich L, Roth M, Philippova M, et al. Bronchial smooth muscle cells of asthmatics promote angiogenesis through elevated secretion of CXC-chemokines (ENA-78, GRO-α, and IL-8) PLoS One 2013; 8(12): e81494. Sharma B, Nawandar DM, Nannuru KC, Varney ML, Singh RK. Targeting CXCR2 enhances chemotherapeutic response, inhibits mammary tumor growth, angiogenesis, and lung metastasis Mol Cancer Ther 2013; 12(5): 799-808. Hertzer KM, Donald GW, Hines OJ. CXCR2: a target for pancreatic cancer treatment? Expert Opin Ther Targets 2013; 17(6): 667-80. Dwyer J, Hebda JK, Le Guelte A, et al. Glioblastoma cell-secreted interleukin-8 induces brain endothelial cell permeability via CXCR2 PLoS One 2012; 7(9): e45562. Bolitho C, Hahn MA, Baxter RC, Marsh DJ. The chemokine CXCL1 induces proliferation in epithelial ovarian cancer cells by transactivation of the epidermal growth factor receptor Endocr Relat Cancer 2010; 17(4): 929-40. Wolff HA, Rolke D, Rave-Fränk M, et al. Analysis of chemokine and chemokine receptor expression in squamous cell carcinoma of the head and neck (SCCHN) cell lines Radiat Environ Biophys 2011; 50(1): 145-54. Saintigny P, Massarelli E, Lin S, et al. CXCR2 expression in tumor cells is a poor prognostic factor and promotes invasion and metastasis in lung adenocarcinoma Cancer Res 2013; 73(2): 571-82. Keane MP, Arenberg DA, Lynch JP III, et al. The CXC chemokines, IL-8 and IP-10, regulate angiogenic activity in idiopathic pulmonary fibrosis J Immunol 1997; 159(3): 1437-43. Belperio JA, Keane MP, Burdick MD, et al. Role of CXCR2/CXCR2 ligands in vascular remodeling during bronchiolitis obliterans syndrome J Clin Invest 2005; 115(5): 1150-62. Keane MP, Donnelly SC, Belperio JA, et al. Imbalance in the expression of CXC chemokines correlates with bronchoalveolar lavage fluid angiogenic activity and procollagen levels in acute respiratory distress syndrome J Immunol 2002; 169(11): 6515-21. Goleva E, Hauk PJ, Hall CF, et al. 2008. Heshmat NM, Mostafa GA, Abd Al-Aziz MM, Abd El-Bary EM. Sputum epithelial cell-derived neutrophil-activating peptide-78 (ENA-78/CXCL5) in asthmatic children J Allergy Clin Immunol 2007; 119(1): S136. Rydell-Törmänen K, Johnson JR, Fattouh R, Jordana M, Erjefält JS. Induction of vascular remodeling in the lung by chronic house dust mite exposure Am J Respir Cell Mol Biol 2008; 39(1): 61-7. Snibson KJ, Bischof RJ, Slocombe RF, Meeusen EN. Airway remodelling and inflammation in sheep lungs after chronic airway challenge with house dust mite Clin Exp Allergy 2005; 35(2): 146-52. Avdalovic MV, Putney LF, Schelegle ES, et al. Vascular remodeling is airway generation-specific in a primate model of chronic asthma Am J Respir Crit Care Med 2006; 174(10): 1069-76. Gregory LG, Jones CP, Walker SA, et al. IL-25 drives remodelling in allergic airways disease induced by house dust mite Thorax 2013; 68(1): 82-90. Kauffman HF, Tamm M, Timmerman JA, Borger P. House dust mite major allergens Der p 1 and Der p 5 activate human airway-derived epithelial cells by protease-dependent and protease-independent mechanisms Clin Mol Allergy 2006; 4: 5. Keglowich L, Tamm M, Zhong J, Miglino N, Borger P. 2014. Kräling BM, Wiederschain DG, Boehm T, Rehn M, Mulliken JB, Moses MA. The role of matrix metalloproteinase activity in the maturation of human capillary endothelial cells in vitro. J Cell Sci 1999; 112(Pt 10): 1599-609. Roy R, Zhang B, Moses MA. Making the cut: protease-mediated regulation of angiogenesis Exp Cell Res 2006; 312(5): 608-22. Bull TM, Clark B, McFann K, Moss M. Pulmonary vascular dysfunction is associated with poor outcomes in patients with acute lung injury Am J Respir Crit Care Med 2010; 182(9): 1123-8. Huerta-Yepez S, Baay-Guzman GJ, Bebenek IG, et al. Hypoxia inducible factor promotes murine allergic airway inflammation and is increased in asthma and rhinitis Allergy 2011; 66(7): 909-18. Wrobel JP, Thompson BR, Williams TJ. Mechanisms of pulmonary hypertension in chronic obstructive pulmonary disease: a pathophysiologic review J Heart Lung Transplant 2012; 31(6): 557-64. Tuder RM, Yun JH, Bhunia A, Fijalkowska I. Hypoxia and chronic lung disease J Mol Med 2007; 85(12): 1317-24. Trian T, Benard G, Begueret H, et al. Bronchial smooth muscle remodeling involves calcium-dependent enhanced mitochondrial biogenesis in asthma J Exp Med 2007; 204(13): 3173-81. Safran M, Kaelin WG Jr. HIF hydroxylation and the mammalian oxygen-sensing pathway J Clin Invest 2003; 111(6): 779-83. Kallio PJ, Pongratz I, Gradin K, McGuire J, Poellinger L. Activation of hypoxia-inducible factor 1alpha: posttranscriptional regulation and conformational change by recruitment of the Arnt transcription factor Proc Natl Acad Sci USA 1997; 94(11): 5667-72. Weidemann A, Johnson RS. Biology of HIF-1alpha Cell Death Differ 2008; 15(4): 621-7. Baay-Guzman GJ, Bebenek IG, Zeidler M, et al. HIF-1 expression is associated with CCL2 chemokine expression in airway inflammatory cells: implications in allergic airway inflammation Respir Res 2012; 13: 60. Baek KJ, Cho JY, Rosenthal P, Alexander LE, Nizet V, Broide DH. Hypoxia potentiates allergen induction of HIF-1α, chemokines, airway inflammation, TGF-β1, and airway remodeling in a mouse model Clin Immunol 2013; 147(1): 27-37. Fajardo I, Svensson L, Bucht A, Pejler G. Increased levels of hypoxia-sensitive proteins in allergic airway inflammation Am J Respir Crit Care Med 2004; 170(5): 477-84. Lee SY, Kwon S, Kim KH, et al. Expression of vascular endothelial growth factor and hypoxia-inducible factor in the airway of asthmatic patients Ann Allergy Asthma Immunol 2006; 97(6): 794-9. Keglowich L, Baraket M, Tamm M, Borger P. Hypoxia exerts dualistic effects on inflammatory and proliferative responses of healthy and asthmatic primary human bronchial smooth muscle cells PLoS One 2014; 9(2): e89875. Chetta A, Marangio E, Olivieri D. Inhaled steroids and airway remodelling in asthma Acta Biomed 2003; 74(3): 121-5. Feltis BN, Wignarajah D, Reid DW, Ward C, Harding R, Walters EH. Effects of inhaled fluticasone on angiogenesis and vascular endothelial growth factor in asthma Thorax 2007; 62(4): 314-9. Wang K, Liu CT, Wu YH, Feng YL, Bai HL. Budesonide/formoterol decreases expression of vascular endothelial growth factor (VEGF) and VEGF receptor 1 within airway remodelling in asthma Adv Ther 2008; 25(4): 342-54. Girodet PO, Ozier A, Bara I, Tunon de Lara JM, Marthan R, Berger P. Airway remodeling in asthma: new mechanisms and potential for pharmacological intervention Pharmacol Ther 2011; 130(3): 325-37. Alexandrova E, Buzdin A, Nassa G, et al. 2015. Cox PG, Miller J, Mitzner W, Leff AR. Radiofrequency ablation of airway smooth muscle for sustained treatment of asthma: preliminary investigations Eur Respir J 2004; 24(4): 659-63. Miller JD, Cox G, Vincic L, Lombard CM, Loomas BE, Danek CJ. A prospective feasibility study of bronchial thermoplasty in the human airway Chest 2005; 127(6): 1999-2006. O’Byrne PM, Naji N, Gauvreau GM. Severe asthma: future treatments Clin Exp Allergy 2012; 42(5): 706-11. Shifren A, Chen A, Castro M. Point: efficacy of bronchial thermoplasty for patients with severe asthma 2011. Thomson NC, Rubin AS, Niven RM, et al. Long-term (5 year) safety of bronchial thermoplasty: Asthma Intervention Research (AIR) trial BMC Pulm Med 2011; 11: 8. Xia YC, Redhu NS, Moir LM, et al. Pro-inflammatory and immunomodulatory functions of airway smooth muscle: emerging concepts Pulm Pharmacol Ther 2013; 26(1): 64-74. Doeing DC, Solway J. Airway smooth muscle in the pathophysiology and treatment of asthma J Appl Physiol 2013; 114(7): 834-43. Chapman RW, Phillips JE, Hipkin RW, Curran AK, Lundell D, Fine JS. CXCR2 antagonists for the treatment of pulmonary disease Pharmacol Ther 2009; 121(1): 55-68. Jones CP, Pitchford SC, Lloyd CM, Rankin SM. CXCR2 mediates the recruitment of endothelial progenitor cells during allergic airways remodeling Stem Cells 2009; 27(12): 3074-81. Harkness LM, Ashton AW, Burgess JK. Asthma is not only an airway disease, but also a vascular disease Pharmacol Ther 2015; 148: 17-33. Wilson JW, Kotsimbos T. Airway vascular remodeling in asthma Curr Allergy Asthma Rep 2003; 3(2): 153-8. Khor YH, Teoh AK, Lam SM, et al. Increased vascular permeability precedes cellular inflammation as asthma control deteriorates Clin Exp Allergy 2009; 39(11): 1659-67.